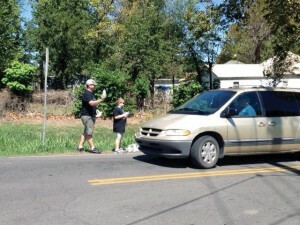 Members of Timothy give away cold bottled water at a Muskogee intersection with the Gospel featured on the bottles. Teddy’s words could be used to rally today’s churches facing a common dilemma. By not attending, people demonstrate they don’t care what the church knows because they don’t believe the church cares about them. Pastor Kelly Payne leads his congregation in doing community service events. They take notice of needs around Muskogee that are not being met and do their part in filling voids. Last July when the annual fireworks show in Muskogee was cancelled due to expenses, Timothy provided fireworks on the church grounds. Church members walked through the crowd to share the Gospel with those attending. On a hot summer day, Timothy bought out a local water park and provided free admission to everyone who came. Many church members also offered water bottles at different intersections in town on various occasions. 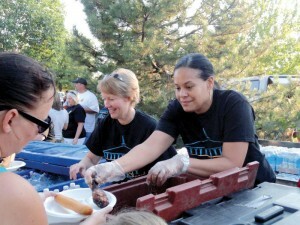 Approximately 3,000 people attended Timothy’s water park event. Timothy paid for admission and fed all attendees at the park. “During our water park event, we gave out our tracts, How To Get To Heaven From Muskogee, Okla. We have seen many people accept Jesus, begin attending church or recommit their life to Jesus as a result of TTM,” Payne said. In October, Timothy hosted a Fall Festival and used carved pumpkins to share the Gospel. In November, they provided 100 food baskets. Cars lined up a quarter-mile down the road, and when they pulled up to receive a basket, a church member prayed for everybody in the car. Community outreach is not a new program for Timothy. Their first outreach was a block party in 2002. Payne said the church still has families attending who joined as a result of the block party. How Timothy has enhanced this program is the frequency. At first it was seasonal, now they do something monthly. And church members are regularly involved. Payne enlists people and has them recruit others to be a part of their teams. Timothy then mobilizes the teams to staff specific events. Payne was asked how he would encourage other churches to follow Timothy’s example. Teddy Roosevelt may be credited for the statement of showing how much you care, but Timothy Church is putting the challenge to practice.